Volkswagen Group China CEO Jochem Heizmann. SHANGHAI (Bloomberg) -- As Volkswagen plots a course toward its goal of becoming the world's biggest automaker by 2018, it's increasingly clear that the path to global dominance runs through places like Lanzhou, in western China. The capital of landlocked Gansu province, which borders the Gobi Desert, is home to a total of 11 dealerships for VW and its sister brands, Audi and Skoda. With a population of 3.6 million, and GDP per capita of about $4,100, Lanzhou is the type of smaller city away from China's prosperous east coast that VW is targeting in its next phase of expansion. "Volkswagen's early entry into China meant that our outlets focused on bigger, developed cities," said Soh Weiming, the carmaker's China executive vice president. "Now, we have to expand beyond them." Less-developed Chinese cities are VW's "bread and butter," Soh said in an interview at the Guangzhou Autoshow on Nov. 21. The appointment of Heizmann, a former trucks chief and head of production planning at the company, underlines the importance of China in VW's plans to overtake General Motors Co. and Toyota Motor Corp. It is also the first time that VW's executive overseeing China has been on the company's group management board, a move VW says increases flexibility and streamlines its daily business there. At stake is a market that IHS Automotive and Macquarie Securities project will eclipse the combined sales of the U.S., Germany and Japan in three years. VW's Volkswagen, Audi and Skoda brands account for a fifth of China's passenger vehicle deliveries, well ahead of General Motors Co., at 9.9 percent with its Buick and Chevrolet nameplates, according to researcher LMC Automotive. Hyundai Motor Co. stands at No. 3 with 9.7 percent, LMC said. VW intends to consolidate its lead with aggressive investment that outpaces that planned by rivals. VW's China ventures have pledged to spend 9.8 billion euros ($12.6 billion) in China through 2015, while GM says it will invest as much as $7 billion in the five years to 2015. China's smaller cities will account for 60 percent of new car deliveries by the end of the decade, up from 40 percent in the past 10 years, McKinsey & Co. predicts. Car sales in so-called third- and fourth-tier cities will grow about 10 percent annually until 2020, versus 4 percent a year in Shanghai and Beijing, McKinsey said. The country, already the world's largest auto market, is set to grow in importance, as a drawn out debt crisis weighs on vehicle sales in Europe. "Globally, growth will be a bit slow," Heizmann told reporters on Nov. 21. "China is different," he said. "In China, every business, every brand is selling especially well." The 60-year-old oversaw factory expansion in China almost two decades ago when he was in charge of planning and commissioning new passenger-car plants at VW. 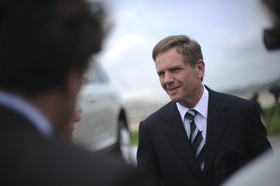 From 2001 to 2007, Heizmann oversaw global production for Audi (NSU), which now counts China as its biggest market. In 2004, he was made a guest professor at Shanghai's Tongji University, which has a research partnership with Audi. VW's joint ventures with SAIC Motor Corp. and China FAW Group Corp. operate or have announced plans for 11 factories in China, with a targeted capacity of 4 million vehicles a year by 2018. The carmaker is also considering a new 300,000-unit plant in Changsha in southern Hunan province, a person familiar with company's plans said this month. VW is currently negotiating an extension to its tie-up with FAW, with which it runs a joint venture making the Jetta sedan and the Audi A6L, a luxury model that was stretched to boost its appeal to Chinese buyers. VW plans to recruit more dealers, increase the number of locally made models for its Skoda brand, and introduce plug-in hybrid vehicles for sale in the "near future," according to a company statement. Sales for Skoda, the Czech carmaker that VW took over after the collapse of communism, rose 6.8 percent to 181,900 units China in the first nine months of this year, company data show. The country became Skoda's biggest market in 2010, three years after it started local production. The new China chief "still has to give more reassurance to customers that there isn't a problem with the engine," Siebert said. "There have been a lot of problems and they need to find a way to better react." Volkswagen's China sales will reach almost 2.7 million vehicles this year, or about 30 percent of its global total, Norddeutsche Landesbank predicts. The automaker says it sold 2.26 million vehicles in China in 2011. "For 60 years, the most important market for VW was Germany; they sold around 1 million cars there," said Norddeutsche Landesbank analyst Frank Schwope. "Four or five years back, China overtook the German market. Now VW is still going to sell 1 million cars in Germany, but 2.7 million cars in China."